20 Questions for Reflecting on your 2011. When I found this list I sent the link to my husband (it looked like something he would enjoy doing, too), and he quickly replied, "Hey, let's do those questions you sent me." This morning we decided to take a walk, just the two of us. I think sometimes we get so caught up in the what all of the "other voices" in our lives are saying, that we just forget to be still and truly evaluate things. While I don't want to go into the conversation we had, I can just tell you it was GOOD. I can tell you I'm so thankful for the solid, faithful, unshakable man I married fifteen years ago. The questions were perfect, and spurred us to really evaluate the past year so we could learn from it and head into 2012 with goals and aspirations. I think this type of exercise is also great for children. 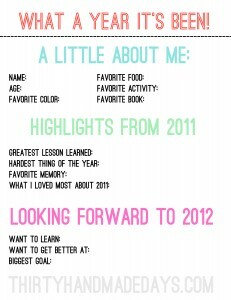 My kids are going to be using a cute little form I found at Thirty Handmade Days to evaluate their 2011 and set goals for 2012. I've included a little snapshot here for you, but head over to the site to download your own .pdf version. Do you set goals as a couple? With your children? Independently? How about reflecting on 2011. Have you really sat down and evaluated the GOOD and the BAD from the past year. I found it to be quite telling. 1. Continue to follow Dave Ramsey's financial plan. We made this goal last year and the progress was astounding - it really works!! 2. Do not let myself fall victim to the time hog that is the internet. Blog with purpose and blog for my family! Use social media MUCH LESS. 3. Educate myself about as much as I can so that I can be the best homeschooling mom for my children - this includes reading a lot of history and researching what's best for my kids. 4. Seize every opportunity - be more spontaneous. I love traveling with my children and taking advantage of all of those teachable moments. I want to do MORE of this. 5. Foster the relationships I am already so blessed to have. Let these people know how much they mean to me. There is a fun link-up right now at The Homeschool Post about goal setting and reflecting. I think it's interesting to read other homeschool bloggers' thoughts on this subject. Happy New Year - I pray your year is full of many blessings!